This scheme is directed by the European Society of Veterinary Endocrinology in partnership with Nationwide Specialist Laboratories. It is aimed at promoting high quality hormonal laboratory testing. It focuses on testing the accuracy of the hormone test results provided by laboratories. Should results prove not to be accurate, ESVE will work with the relevant laboratory to improve this. The scheme is therefore ensuring the correct diagnosis of endocrine disease in companion animals. All laboratories are welcome to join and participation in the scheme will emphasise the forward thinking nature of such laboratory. Each participating laboratory will receive a set of test samples in lyophilised form for reconstitution and evaluation of specific endocrine assays. Samples will be shipped to all registered laboratories on the same pre-arranged day. Helen Evans of Nationwide Specialist Laboratory Services will be responsible for overseeing preparation and shipping of these samples and for receiving and collating data from participating laboratories. The assays will be specified in advance and samples will be selected to provide a range of values within the assays under evaluation. Which laboratories are eligible to participate? Any laboratory routinely running endocrine assays is eligible to participate as long as at least one person associated with the laboratory is an ESVE member, although this does not necessarily have to be a person who works in the lab and performs the assays. In the initial stages of the project we are seeking to recruit mainly laboratories within Universities and teaching institutions although we would also welcome enquiries from commercial laboratories wishing to participate. The EVE-QAS is not being run for profit and initial costs have been covered by ESVE and by Dechra Sponsorship. There will be no initial cost to participate in the scheme for the first year, although no reimbursement can be provided for the cost to each laboratory of running the assays on each set of test samples. Depending on the availability of subsequent sponsorship it is possible that a nominal change for each ‘release’ of samples may be required to cover costs in future. How often will samples be sent to participating labs? It is expected that there will be two sets of samples sent to laboratories each year. How long will I have to undertake the assays after I have received them? All registered laboratories will have the samples shipped to them on the same pre-arranged date and all assays should be completed and data returned within 2 weeks. Which analytes will be tested? Analytes will be limited in number at first and as the scheme progresses, additional analytes will be added to an initial core (of around 5) and may vary depending on each sample release. 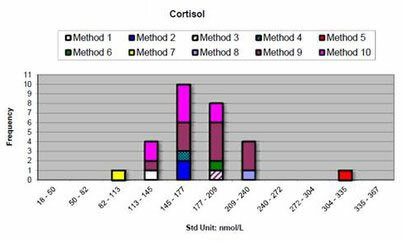 A range of assays will be covered, with typical assays including T4, TSH, cortisol, fructosamine, aldosterone. All laboratories will submit samples using a unique code to ensure anonymity of individual institutions and laboratories. Summary data will be collated by Peter Graham and will be shared amongst ESVE members and participants once the data from each ‘release’ of samples has been analysed. Any laboratory whose values for any assay fall outside the expected values will be contacted directly to investigate the reasons for any discrepancies. What happens if my results do not match those of other labs? As mentioned above, any laboratory whose values for any assay fall outside the expected values will be contacted directly to investigate the reasons for any discrepancies. Details of which laboratories are contacted will remain confidential. The ESVE is committed to improving quality control by working in partnership with laboratories with discordant results to determine the reasons for these issues. What are the benefits of the scheme to participating laboratories? External Quality Assessment (proficiency testing) is an essential part of any clinical pathology service. Participation in this external scheme will be in addition to internal Quality Assurance schemes already in place, and will provide an extra level of confidence in the data generated from individual centres. Laboratories participating in the EVE-QAS scheme will be listed on the ESVE website. Is there a minimum duration of participation? Laboratories are expected to register for participation in advance, but may leave the scheme at any time. Re-registration will be required every 5 years. Notice of resignation from the scheme may be given at any time, but due to the cost of lyophilising and shipping the samples, if resignation occurs within one month of sample shipment the laboratory will still be expected to participate in the analysis of this batch of samples. Please contact Peter Graham using the following address: eqa.esve@gmail.com.